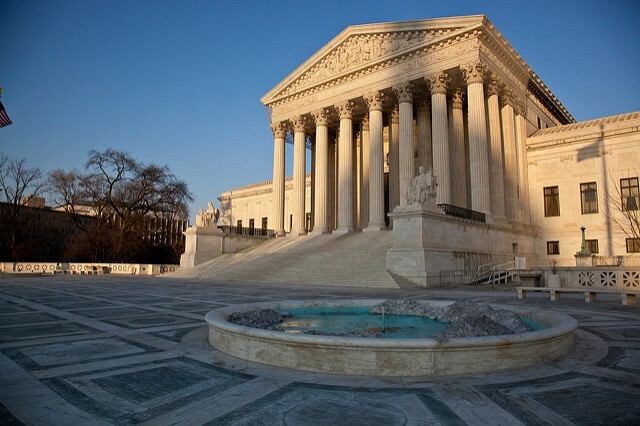 When the Supreme Court hears arguments next month in U.S. vs Texas, the immigration executive action case, the first question the Justices will have to decide is whether Texas and the other states on this lawsuit even have the right to sue. That’s called “standing.” And, it’s important because not every disagreement has the right to be aired out in a federal court just because one party is upset. Standing is a legal term which determines whether the party bringing the lawsuit has the right to do so. As a general rule, federal courts only have authority to hear actual controversies, a term that does not include “political questions.” Here the question the Supreme Court will have to answer is whether the GOP lawsuit presents a legal claim or a political dispute that has no place in court. Former U.S. Solicitor General Walter Dellinger has weighed in clearly and unequivocally. “Indeed, this case has all the trappings of an epic political battle” he argued in an amicus brief filed with the Supreme Court in support of the immigration actions. Thing is, for over 200 years, the U.S. judicial system has avoided hearing cases involving “political questions.” What’s abundantly clear to legal analysts is that U.S. v Texas is a political dispute that has no place in the courts. Last week, the Speaker of the House Paul Ryan proved that point by holding what he called an “extraordinary” vote to put members on the record on the Texas case. Couched as a vote to support his filing of an amicus brief in support of the Republican lawsuit, it’s actually a vote to show the nativist wing of the GOP, spurred on by Donald Trump, that Ryan’s caucus is 100% behind the Republican politicians who filed to block the immigration executive actions. The first thing to know about the lawsuit brought by two dozen states to block President Obama’s executive actions on immigration is that it is a meritless screed wrapped in flimsy legal cloth and deposited on the doorstep of a federal district judge in Brownsville, Tex. The second thing to know is that the judge, Andrew Hanen, may well look kindly on the suit. He made news in 2013 with a politically charged ruling accusing the Obama administration of criminally conspiring with Mexican drug cartels to smuggle children over the border (he really said that), which is surely why the plaintiffs like their chances. They all knew what they were getting — and those GOP Governors and Attorneys General got the ruling they wanted from Hanen. Altogether, the [Texas] complaint reads as if it were cobbled together on the sofa of “Fox & Friends.” Based on the avalanche of ill consequences envisioned by Texas, however, the judge found that the state had standing to sue. So Hanen’s injunction has halted, for now, Obama’s executive action. Judge Hanen’s ruling in Texas v. United States closely mirrors his impassioned but gratuitous commentaries in several cases attacking the Obama administration’s immigration policies and its policymaking officials. In each instance, Judge Hanen discarded the conventional norms of adjudication and the adversarial process and exhibited an unusually high degree of personal interest, animosity, and emotional involvement in immigration-related questions far afield from the issues actually before the court. These surrounding facts and circumstances might or might not rise to a level that would warrant his disqualification or reassignment on remand…. …Like Judge Hanen’s earlier immigration-related opinions, therefore, Texas v. United States reads more like a document written to intervene in political debates than a judicial opinion carefully analyzing legal issues arising from DACA and DAPA. He writes nonchalantly about “self-deportation” as if that were a noncontroversial, ordinary thing to discuss, and offers provocative commentary on a series of controversial but ultimately tangential immigration-related matters, including the “flood” of unaccompanied minors, the “specter of terrorism,” and the inability of the “powers that be in Washington” to enact immigration reform. To a striking extent, Judge Hanen engages those political debates in personal terms. He repeatedly emphasizes (and distorts) statements by President Obama about the initiatives, including offhand comments in response to informal questions, and treats them as if they had determinative legal significance — even as he acknowledges that the President himself “has not directly instituted any program at issue in this case” and largely disregards the administration’s legal justifications for the initiatives, as opposed to its political motivations. The claim of Texas and its allies to standing is preposterous. The Fifth Circuit majority found that the state’s concrete injury lies in the fact that some 500,000 undocumented Texas residents would be entitled under the deferral program to obtain drivers’ licenses, and the state, which charges $25 for a six-year license, would lose “a minimum of $130.89” on each license. “Even a modest estimate would put the loss at several million dollars.” Hmmm. My own user-friendly state of Connecticut charges $66 for an ordinary driver’s license and offers undocumented immigrants a drive-only license (legal authorization to drive, but not to be used for identification) for a $72 fee. I guess the great state of Texas would rather fight the federal government than figure out how to balance its motor vehicle department’s books. Conservative Republicans who oppose the president’s executive action on immigration object to broadening standing to include parties — like Texas — that have a generalized grievance that can be resolved through the political process….The Supreme Court should use the challenge to President Obama’s immigration policy to remind states that litigation is not an alternative to the political process. Apart from the fallacious argument on the president’s powers, the states have no standing to sue. Texas claims that it has that right simply because it thinks the president’s orders would harm its economy. If the court were to accept this kind of claim, it would mean that any time a state or city opposed a federal action, it could drag that political dispute into the courts. This is a case that should have been tossed out of Federal District Court in the first instance. Instead, its stakes are now heightened enormously. If the justices approach their task as judges and not as politicians, the administration will easily prevail. It is the Roberts court that now needs to take care. The bottom line is that the lower courts erred by allowing Texas to pursue a political grievance without showing any real harm. The nationwide injunction is preventing the states and their residents from receiving the substantial economic, public safety, and humanitarian benefits that will flow from the president’s immigration actions. Hopefully, the Supreme Court will recognize these realities, reverse the Fifth Circuit, and allow the president to make the same sorts of immigration enforcement decisions that his predecessors have made for decades. We all stand to benefit. Immigration reform is a contentious policy issue best left to the political branches of government. The litigation in this case in fact is part of a larger political struggle. Some political actors disliked the Obama administration’s discretionary policy judgment and went to federal court to stop that policy from being implemented (a ploy that apparently could not have been secured through Congress). The use of the federal courts as a political weapon in a national debate was precisely what the framers of Article III of the Constitution sought to prevent. U.S. v Texas presents the Supreme Court an opportunity to demonstrate to the nation that the the justices will not allow the judiciary to be used as a forum for political disputes. The justices should remain true to their oaths of office, dismiss this shamelessly political lawsuit, lift the injunction on the immigration executive actions and make clear to the nation that political battles are to be waged at the ballot box, not in the federal courts.